THE WORLD TRIP HAS TO BE FACED ONCE YOU ARE READY. HERE SOME ADVENTURES THAT HAVE TO BE REMEMBERED. 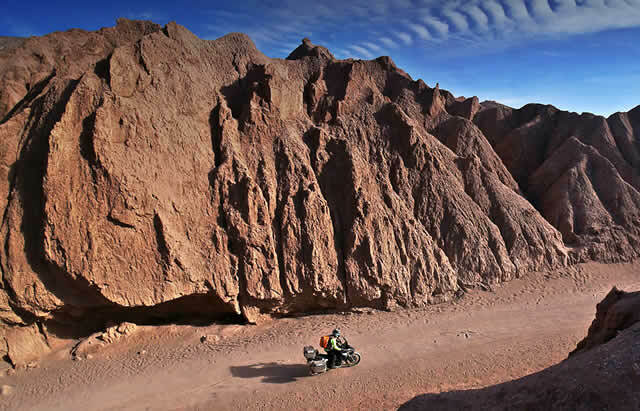 In 2014, Mario Ciaccia and Paola Verani, journalists from Motociclismo, wrote a really interesting article, that presented some features which brought some people to decide to start a world trip with their own motorbike. With the permission of the director, we are going to give you some of those steps, with the suggestion to search and read the original dossier, 16 precious pages to be reminded. If the weather doesn’t interfere, the world trip can be planned with any motorbike, scooter or motorcycle (with this one someone had traveled across Africa) at almost every age. The first one to do that, according to the experts, was Robert Edison Fulton Jr in 1931. He lived between USA and Europe, in contact with a lot of “special” people. His father was a Thomas Edison’s friend, his uncle created the most famous bus company in the world, the Greyound and he exceled as an inventor, with 70 patents. The “world trip” idea came out during a dinner time, to conquest a cute lady. The problem was that at that table was sitting as well the Douglas Motor Works administrator, who answered “ we are giving you the motorbike”!. At that point, to give up on the “world trip” meant “loosing the face”. His travel lasted a couple of years, he went throgh 22 Countries along 40 Miles. After that awsome event, Robert wrote “ONE MAN CARAVAN”, a book revered by Ted Simon as the best motorbike travels book ever made. Mr Simon is the globe-trotter who everyone is referenced to. In 1973 when he was 42, he made his world trip with his Triumph Tiger 100. But it doesn’t end here. Lately when he was 70, in 2001, Ted decided to remake the same travel. This experience is written into a famous book named “JUPITER TRAVELS”, released in 2007. From this story the british actor Ewan McGregor took a huge inspiration for the Long Way Round project. In 1957 the world trip has been accomplished by two Italians: Leopoldo Tartarini and Giorgio Monetti. They made it with two DUCATI 175, bringing with them a really few things plus a camera and a 16mm cinecamera to document it. 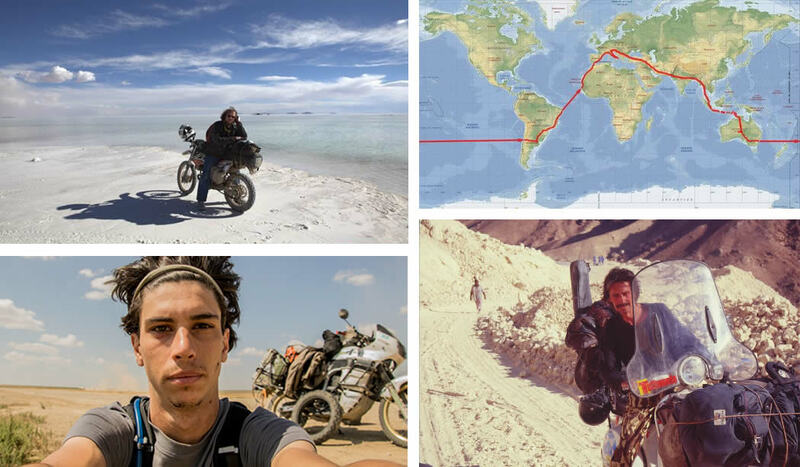 They went across all five continents in one year, and traveled almost 100000 km through 35 Countries. In those years, Tartarini, a famous pilot, left the races after an incident, and Monetti was a globe-trotter student. His travel was sponsorized by DUCATI, which used that moment to advertise his brand over the world. The story has been written into a book and has been told into a movie made from Popcult. The world trip is a particoular kind of challenge. There are actually no written rules. Someone decides to leave for a year, leaving without knowing when coming back, like the british Sam Manicom, the german Daniel Rintz, and “our” Italian Gionata Nancini. He left when he was 20 and traveled for 8 years. He didn’t plan anything, he just kept on touring around until his desire to come back came back. His travel is the typical “never ending” trip, which, to be accomplished, force you to find a lot of “fast” jobs: practically the perfect situation plus a huge age advantage. Then there is someone who wants to “close the circle” making it as fast as possible, and then there is someone who aims to pass through as much Countries as possible, converting the route into a zig zag. To the first category, belongs Lorenzo Piolini: he dedicated to his travel less then 3 months, taking inspiration from Phileas Fogg, the main character from the Julies Verne’s romance “The world trip in 80 days”. Lorenzo made it with his Honda Transalp. Did he won something? Probably not.. but better do it then not; in fact there are a lot of writers who wrote about places of the Earth without even moving from home. Lorenzo decided to taste a little bit of everything: a sort of little book about traveling. The “watch everything with the less time you can” philosophy was adopted as well by Marcello Anglana who, without having much time because of a lot of commitments, studied timing and costs. Comparing the Lorenzo’s and Marcello’s trips we can find out that even if they were both “fast travels” they present a lot of differences: Marcello made it with a Honda Goldwing and with a 30.000 euro budget versus a 9.000 euro budget for Lorenzo. How much does the knowledge of the mechanic vehicle influence these contexts? It has its value, but it’s not as important as u can imagine. For example Giorgio Bettinelli (we are going to speak about him soon) became a motorcycle rider, or better, a scooter rider, on the spot without knowing anything of motorcycles. Simone Cannizzo made awesome trips too, and his opinion is: the vehicle to use for these challenges hasn’t a lot of influence.. He passed through Africa with a scooter, and through the America Continent (North, Center and South America) with a 50cc. Here there is another way to make the World trip, maybe across your lifetime and without planning it from the beginning. The group of rider who are into this category are the ones who start with a journey from A to B and then , maybe after years, from B to C and so on. Giampiero Pagliocchini is one of the most famous. He went through ten thousand miles almost everywhere. Putting all his travels togheter… probably the result can be a world trip. Before him, just to mention, there were Giovanni Carlo Nuzzo, (he made the journey around the world with a Gilera 125 2T) and the great Giorgio Bettinelli, journalist, writer, singer, actor and traveler who in his books tells about his trips on his Vespa. This is his story. He began traveling when he was 14 through autostops. From 17 he started from Trieste to India with a Magic Bus. He accomplished his bachelor’s degree in literature and in 1992 he started the trip which made him famous with his Vespa from Mentana to Saigon. The book about this journey has been pressed over 10 times. Then he went from Anchorage to the Fire Land, supported by Piaggio, and then from Melbourne to Cape Town, followed by a coast to coast all over the South Asia from Yemen to Indonesia till arriving in Australia with final destination in Tasmania. During this long trip Giorgio was robbed of everything from a group of guerrillas (in Congo). His last travel was in Cina, where he got married and lived. This travel was in 2006, and is written into his last book “China with a Vespa”. In 2008 he died at Jinghong, next the Mekong river when he was 53.